In this rambunctious showdown between characters new and old, Jocelyn puts her own brand of pirating to the test in a quest to save her future and those she loves. ! 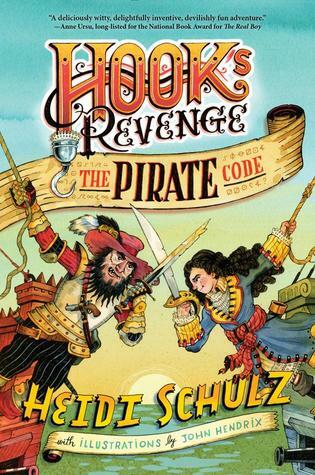 Review – In my review for the first book HOOK’S REVENGE (or HOOK’S DAUGHTER in the UK) I spoke about how Schulz turns Jocelyn’s fantastical adventures into something that any kid can relate to. While Jocelyn’s solutions are not always possible for the average middle school kid, how she comes upon those solutions can be applied to any situation. I would have loved to have Jocelyn as my friend (though perhaps not as my student). In this book she has to face not only Blackbeard’s ruthless and manipulative intentions towards her late, deceased father’s hidden treasure, but what to do when she comes across a girl she actually likes even as she envies her. Evie isn’t like the girls Jocelyn knew at the boarding school–she’s not spiteful, petty or gossipy. She didn’t want to talk about dresses and hair and boys. She wanted adventure and excitement and thought it was ever so exciting to be kidnapped by pirates. In short she was the perfect sort of friend for Jocelyn. Except Evie, who is a couple years older than Jocelyn and seems to have the correct answer to everything ever, makes Jocelyn feel jealous. With her pretty hair and her winning smile and infectious cheerful enthusiasm, Jocelyn finds herself uncertain whether she wants to ring her neck for being distracting or enlist her as a proper pirate (especially if it meant annoying that blasted Pan boy). Then there’s also Tiger Lily who is so capable and such a great leader to her people, Jocelyn finds herself feeling less in comparison. Which is decidedly at odds with the fact she is Hook’s daughter, his only surviving heir and the one HE entrusted with his ship and treasure (if she could find it). I know when I was 12/13 years old I often found myself feeling conflicted and uncertain about my own abilities. Its a difficult age to understand yourself even if you’re just trying to navigate the local middle school and not treacherous waters filled with yellow bellied slugs who dare to call themselves pirates. None of that detracts from the fun of the story though. Nor the fact that in the end its not outside validation that convinces Jocelyn she’s amazing, its her own surety of belief in herself and knowledge that while Tiger Lily and Evie have their accomplishments, she has her own that can never be taken away from her.